My hubby works at the hospital but does rotations out to other hospitals. When he's at the VA hospital, there's no cafeteria there so he mostly relies on me for lunch, or just goes hungry. I'm great at packing snacks but not so great at remembering to make lunches. It doesn't help that when I DO go out of my way to pack him a lunch, he forgets it in the fridge before he leaves, 90% of the time. It drives me nuts! But a couple years ago I had made him a bunch of burritos that I froze away and that he could simply unwrap and microwave and eat. He loved them so much, sharing them with his work colleague occasionally. It helps that there's a fridge at the VA so he can store them all in one trip and doesn't have to remember to take them every morning. I thought I'd share my recipe to help others! This is a really tasty, filling, and healthy meal and you can put together enough to last you a month in about an hour, what could be better than that? 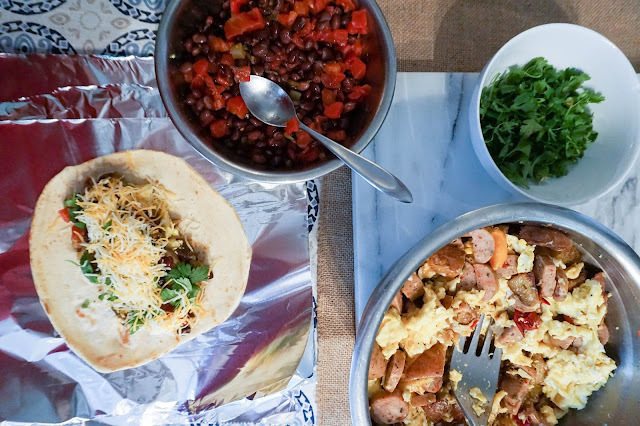 It's worth it to spend a Sunday wrapping these up--maybe even with your roommate/spouse/partner--to have a ready made meal any time so no one has to ever go hangry again. The nice thing is, you can also customize them to your own personal taste. I always pack hot sauce for Joe to dip the burrito in, but I also try to vary the spices within each burrito. This time, I alternated between garlic, chipotle, chili-lime, and smoked paprika seasonings. 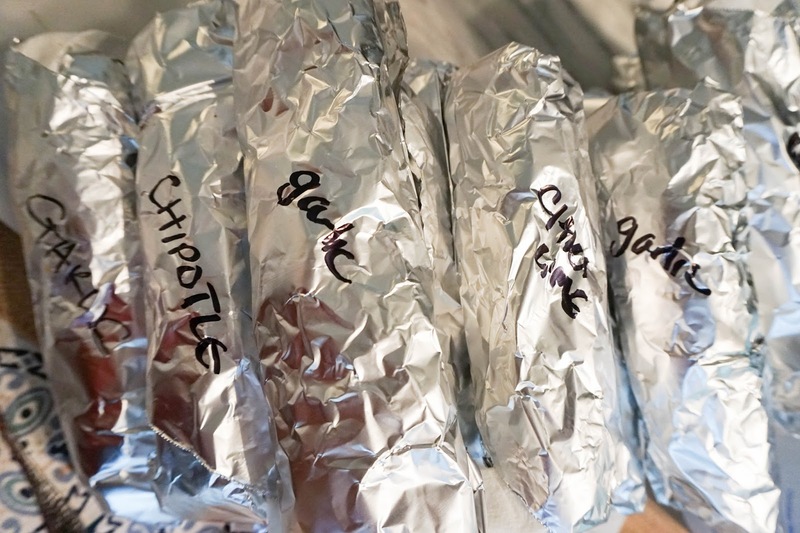 It always helps to label each burrito with both the seasoning it contains and the date, just in case you lose one in your freezer and find it a year later, it would be nice to know when you put it there! Hopefully this helps inspire you guys to make your own variations, let me know in the comments if you try it. 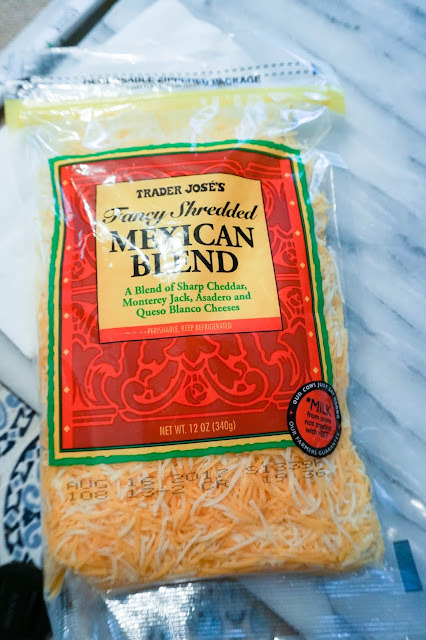 I bought all my ingredients at my favorite place, Trader Joe's, and the total came to about $25.00, which makes it a pretty great money saver, too. 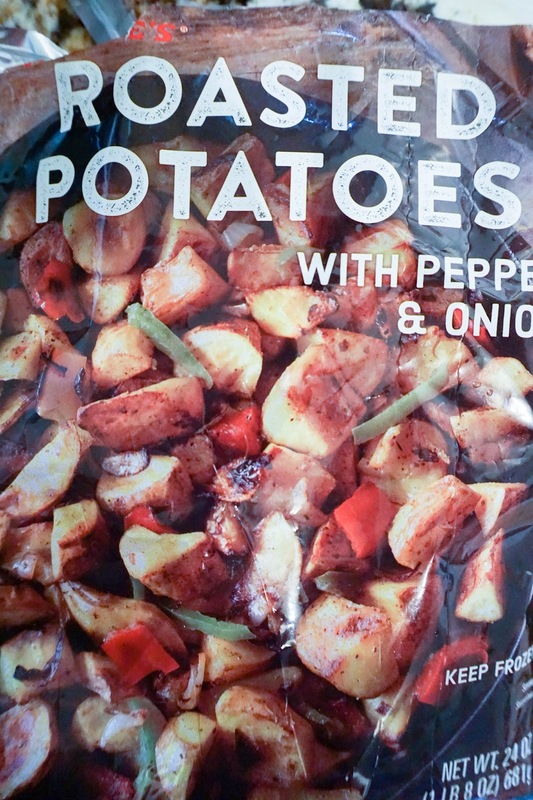 You can find any of these ingredients elsewhere, I just like that they have a bag of chopped frozen potatoes paired with onions and peppers, it cuts down my prep time significantly and adds great flavor. First, cook the entire packet of potatoes, peppers, and onions in a large skillet (don't overcrowd it, do it in batches if you must). Once it's heated through and sauteed, scrape it into a large bowl. In another bowl, add the tomatoes and both cans of beans. After you cook the peppers, beat all the eggs in a bowl until the yolks are broken, and then scramble with some oil in the skillet. 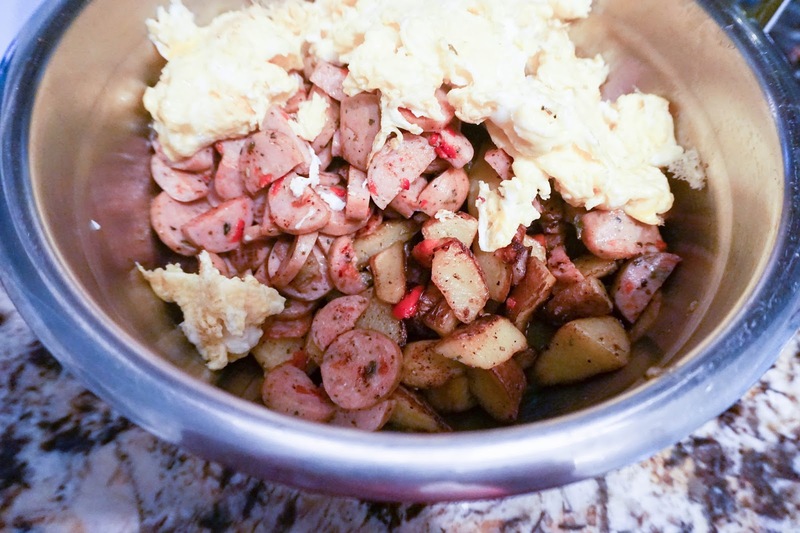 Scrape it into the bowl with the potatoes. Lastly, slice the sausage and sautee it in the skillet until browned. Add it to the eggs, potatoes, peppers and onions. 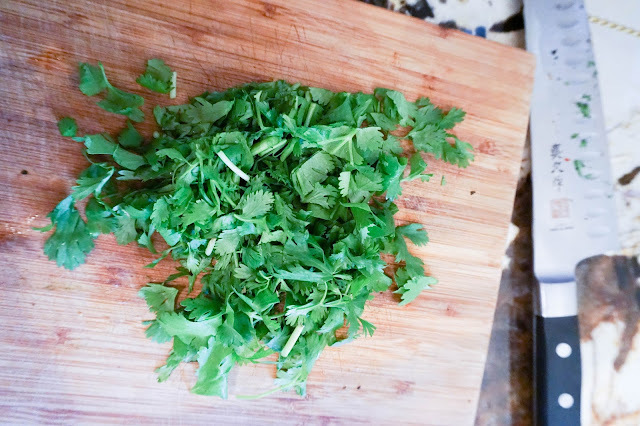 Chop up the cilantro and set aside. 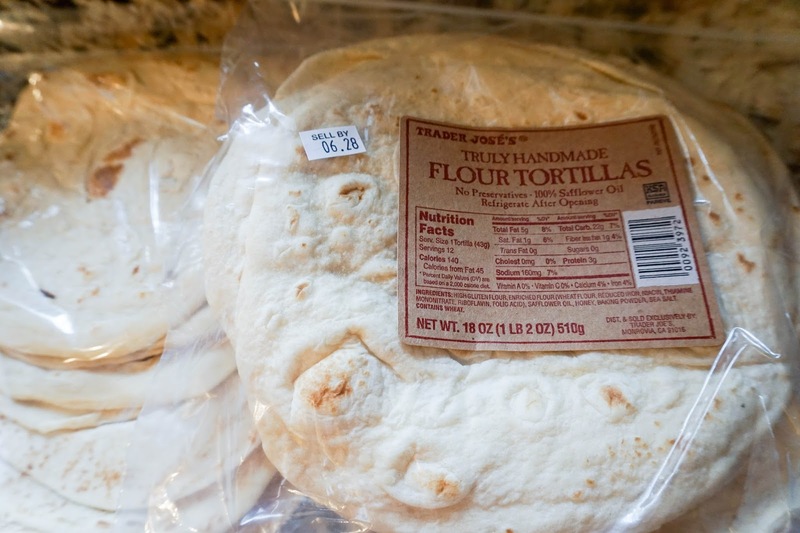 Place all the tortillas in a large plate and place a wet paper towel over them, completely covering them. Microwave for about 30 seconds or until they are slightly warm. Tear out squares of aluminum foil and take one square and put a tortilla down on it. 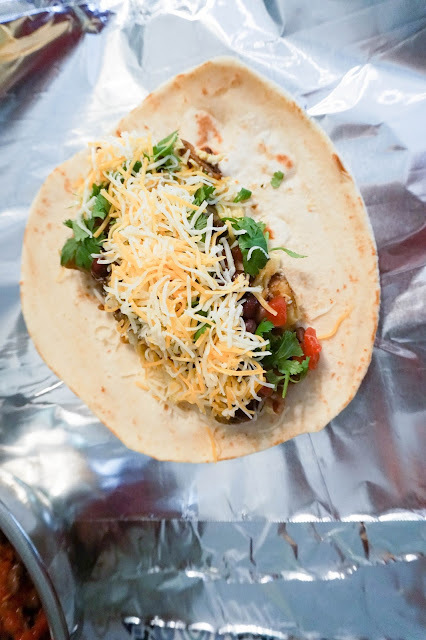 Spread a little (or a lot) of the filling in a line down the center of the tortilla. Choose your seasoning of your choice and sprinkle on top evenly. Fold the tortilla the best you can and use the foil to roll it up. Roll once, then fold in the sides and continue rolling. Remember to label each burrito with what seasoning you used and the date. When warming up to eat, if you wrap a wet paper towel around it and place it in the microwave, the outside will get nice and soft and it will taste fresher. 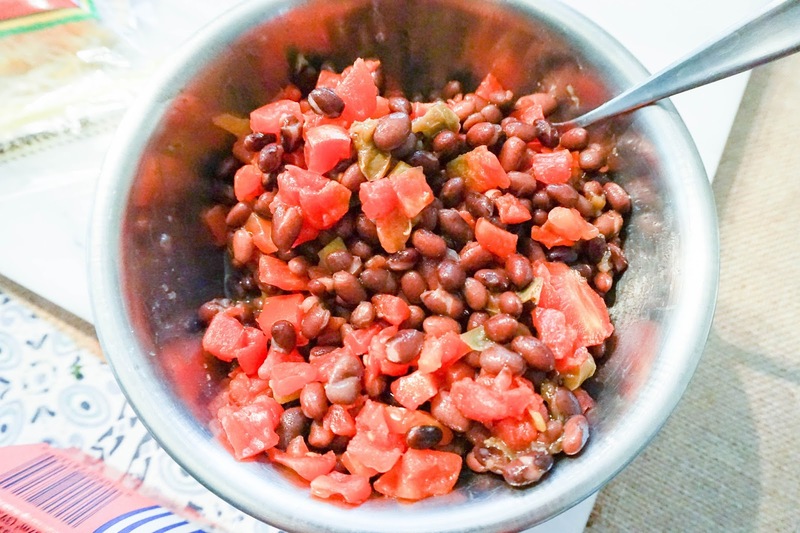 Serve with sriracha sauce or any other salsa or Mexican hot sauce!